solo/autox car rules re. C Prepared or other class? I've a 66 corsa 140/4spd/posi that I am nearing completion on body work. I have read Mr. Blackwell's site: [autoxer.skiblack.com], however it is a little light on examples of CP car modifications commonly employed. It seems like it would be similar to SCCA D or E Production setup, but I wanted to know if there are any documented Solo CP LM vairs out there? I'm not too interested in running at the front, just by-the-book fun, but I would like to pick a class before I start spending money (right now I just spend time on body work!!). I'd be perfectly happy running Street Prepared to be honest, but the engineer in me would like to have a bit more tinkering headroom... Also it has been 15 years since I did an autox. Ran a street VW GTI then. Edited 1 time(s). Last edit at 08/10/2018 12:34PM by MattNall. We have several SCCA racers here.... although FB "Corvair Racers" is where many hangout..
Mark Wright / Solo2R is most active here and is a winner in SM. Thanks everyone. I completely missed Street Modified in the rulebook. That is a nice looking class -- and it looks like a natural place to grow into after street prepared, Whereas the jump from SP to CP is like building a different car all together. I think I will carefully plan out a stinger-ish clone for SP class and see where things go. I will post pictures of my corsa this weekend! Looks like my copy of Performance Corvairs by Emerson and Fisher will carry me most of the way. If you are building from scratch, check out the "Heritage Classic" classes in the SCCA rules. There are only two, Heritage Street and Heritage Race. 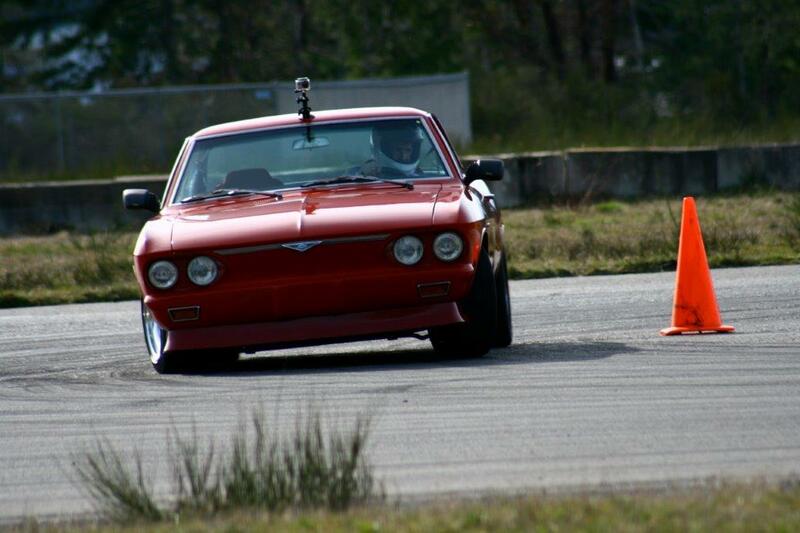 Although currently intended for Vintage imported cars, a Corvair built to the rules should be quite competitive. No V8s in the class. Check it out - And have fun! The class Seth showed looks great but what does this rule mean? Looks to me like we can't run there. The Heritage classic series look good. 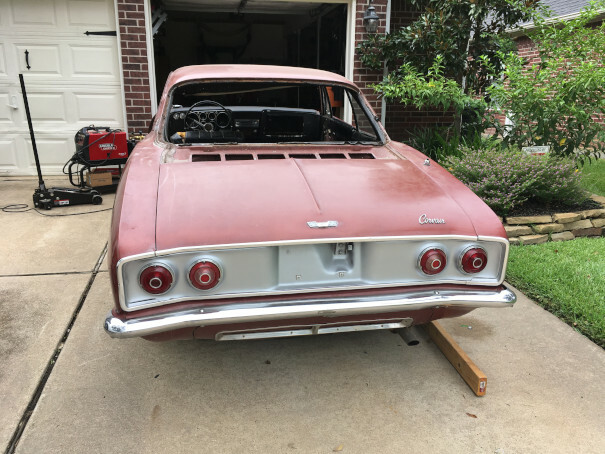 I think the corvair would fit into the 'spirit' of the class, however it does look like one would need to petition that "not produced by [US MFG]" be re-done. I imagine this will be a field of spridgets that are too stubborn to give up their BMC a-series running gear. Once you get used to that piece of farm equipment, everything else looks vulgar by comparison I suppose. edit: oh and I saw the heritage classic explicitly includes formula vee cars... I hope this class gets popular -- that sounds like stiff competition! Edited 1 time(s). Last edit at 08/10/2018 07:03AM by shickapooka800. I took this up with SCCA - The Heritage Rules are a suggested classing structure. A local or regional SCCA group can waive the "imports only" rule. The Spirit of the classes is bringing out vintage cars that would be gathering dust in some garage. I suggested Pintos and Vegas would also be "period Correct". It is also worth noting, unless you dominate the class, nobody will say anything, Just stick to the prep rules and go and have fun. And if you are an SCCA member and want them to change their suggested "Furrin-car-only" suggestions, write the SCCA solo events board. And ask for it. I did! Re: solo/autox car rules re. C Prepared or other class? It is also worth noting, unless you dominate the class, nobody will say anything, Just stick to the prep rules and go and have fun. Just like in Landspeed...you go fast and you get looked at harder. SCTA-BNI rulebook is full of gray area stuff...especially the aero packaging. Took me five years to learn that book...it's Richard's favorite reading material. Edited 1 time(s). Last edit at 08/10/2018 02:07PM by Phil Dally. If I'm not mistaken in CP the minimum weight is 1850 lbs. Lots of room for engineering and creativity to get down to that weight! A single turbo would be legal because Corvairs came with a single turbo, but any modern turbo could be used. Any induction (read fuel injection) you want, I think. Lots of leeway in suspension and brakes. It would be a fun class, but could get expensive. As far as I can tell, no one has built an all-out CP that pushes to the limits of the rules. Some will say that Charlie Clark has done so, but from what I have seen of the car, I would not say so. It remains to be done in my mind. It could be that this is what Tom Vohs in Salem, Oregon is working up to, but not enough is yet known about his project. Street Modified and CP are among the top $$$ to have a competitive car. And our 108" wheelbase is very hard to beat a 500+ HP 100"[and less] wheelbase car. Yes, Mark. That is a significant limitation. But the minimum weight for the other cars in CP is 2750 lbs. 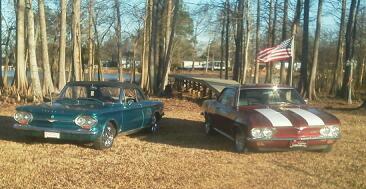 A Corvair could have a 900 lbs. advantage over any other car in CP. It still probably doesn't make it the equal of the 600 hp ground-pounding V8s in the class for acceleration. But 900 lbs. can make a huge difference in cornering and braking too. And don't forget that most of those pony cars in CP also have 108" wheelbases! 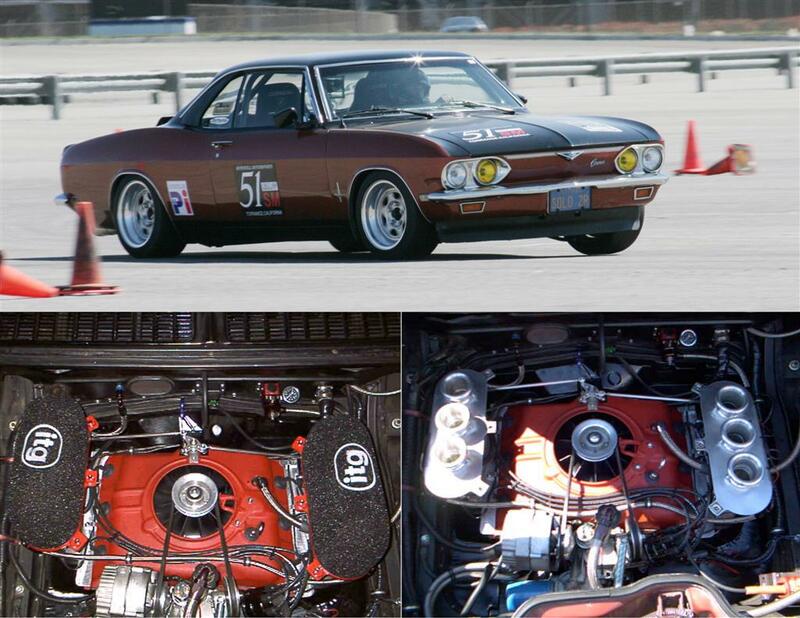 I still wonder if an all-out CP Corvair with modern injection and turbo could be competitive. I agree that in Street Mod, the mountain is probably too big to climb. Let's stretch the rules a bit for C/P. First, the rules now allow any GM engine to be swapped in. (gotta be in the back, though). In addition any production transaxle is allowed from any make of car. Although the rules are a bit fuzzy, a turbo motor might be legal, because the Corvair was available with a turbo (only a single turbo, though.) And the Corvair has specifically been allowed to swap to water cooling. So a Z06 Corvette motor can be installed with a beefed up Porsche transaxle. 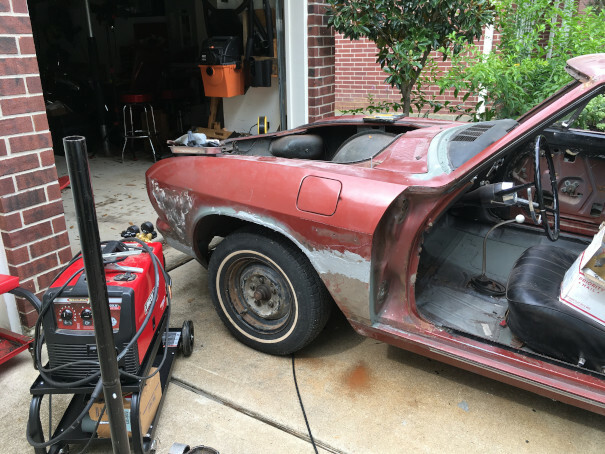 The block to transaxle interface point must be at the same place as on the Corvair. Suspension, both front and rear is basically free. There are some maximum track width limits, based on the original track. Best of all, with all this done, you could still run at the 1850 lbs minimum weight. Good luck getting there, but if you can, it is legal. Note - If you decide to build to this idea, You better be successful right away. That 1850 minimum weight will disappear quickly. note #2 - bring Money. Are you thinking of a 2.0 liter Turbo EcoTec engine out of a Cobalt/Saturn Sky/Pontiac Solstice? They say they can be made to make crazy amounts of power, well beyond their factory 260 hp rating. I think a powertrain change [of any car] should be in modified class. Ours is the Spirit of the car! I'm not casting shade on anybody's efforts. Charlie's car is beautiful. I'm just saying that to have a shot at competitivity in CP you'd have to really think outside of the box. Something along the lines that Seth is pointing out above. Under 2000 lbs. 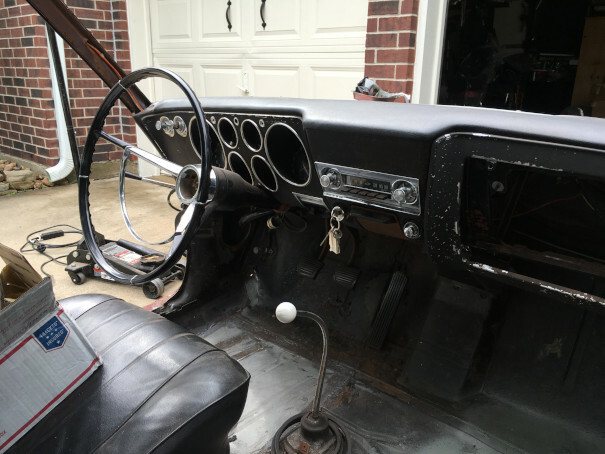 ; a power to weight ratio of under 5:1 means at least 400 hp (this precludes both the Corvair engine and the Corvair transaxle; a ground up build for suspension, steering, and brakes. I just wish I had the bank account to try it. Thanks again for all the advise. As promised here are some images. As I mentioned I am nearly finished with body repairs using repro panels. Not much was needed -- just the typical areas. I will be reluctantly re-spraying the car in the aztec bronze it came in. Not a fan of the color, but I'm not picky enough to spoil what I suppose is on the more limited end of the spectrum (66 corsa in aztec bronze). I quite like the second color hood/A-pillar look though, so maybe I will do that bit in gloss black to break up the sea of bronze. Engine runs well, and I try and start it each time I peck at the body work. Brakes are good too for now -- the car is basically roadworthy before I started the body. I will be doing repair/service on everything mechanical however -- in due time. Do you guys in SM class run drums? Seems like they would do just fine, but I'm unsure. Solo2r: you mention in some other, really old, post about troubles in Street prepared because you didn't have a 'real' yenko?? Was this because you were in F-street or did they just not like you doing well in the correct E-street? I won't be doing well enough to attract attention, but I thought it was an interesting experience that I'd like to learn more about. Edit: you will note that I only have one muffler. this is because the other was removed to give me room to work on the rear lower quarter panel and the support metal behind it. Edited 1 time(s). Last edit at 08/12/2018 07:17PM by shickapooka800.